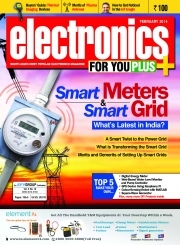 Description of "Electronics For You, February 2014 (eBook)"
Smart Grid technologies will modernise our entire energy industry. This issue of EFY focuses on the amazing electronics angle of this upcoming modernised grid, both from an industry as well as technology perspective. You will also discover the latest on accelerometers and gyroscopes, and what thermal imagers mean for the electronics engineer. Apart from these, you can find numerous other stories in this issue. Over the last four decades, the EFY Group has become synonymous with information on cutting-edge technology. Today, this renowned media group is spread across eight cities of India, and caters to over two million techies spread across the globe. Its print publications not only reach every nook and corner of India but are also read by techies in South Asian countries, like Nepal, Pakistan, Bangladesh, Sri Lanka, Bhutan, and Afghanistan. The Group is also amongst the few Indian publishers to have its publications distributed in Singapore and Malaysia. Reviews of "Electronics For You, February 2014 (eBook)"